Phenylalanine is an essential amino acid and your body does not produce it on its own. You will have to get it from the food you eat or through supplements. Amino acids are the foundation for the synthesis of proteins in the body. Inside the body phenylalanine gets converted into tyrosine, which is also an amino acid. This is used for the synthesis of dopamine and norepinephrine, two major neurotransmitters. They promote alertness and focus. Phenylalanine can also have an affect your mood, pain, perception, memory and learning. It also influences your appetite suppression. Phenylalanine is used commonly for treating arthritis, migraine, depression, Parkinson’s disease and schizophrenia. 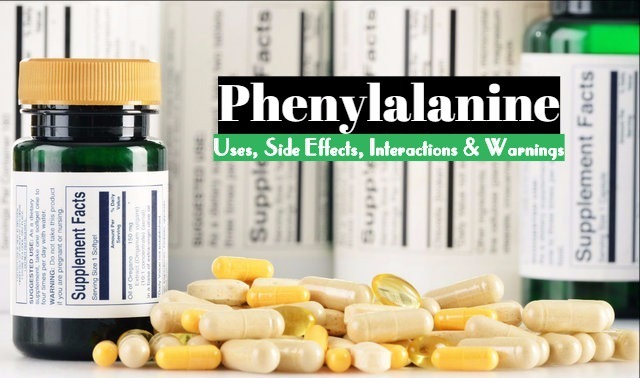 What is phenylalanine used for in the body? Phenylalanine is available commercially in L-, D- and DL- phenylalanine forms. L- The ‘L’ in front of amino acids or other supplements means that it is in its free form, the amino acid is not attached to another amino acid. This is the most common form and is found in any food that contain proteins. Aspartamine, an artificial sweetener, is rich in phenylalanine. D- The‘D’ means that it is a synthetically created amino acid. ‘D’ stands for devo (right), while ‘L’ stands for levo (left). The D-form is a good painkiller. It is not found in any food products. It has to be manufactured in the laboratory. DL- DL stands for natural forms of phenylalanine found commonly in foods rich in protein. It contains two different forms of phenylalanine, the L-form and D-form. DL-form of phenylalanine is a combination of natural as well as synthetic phenylalanine. It is synthetically created with 50% D- phenylalanine and 50% L- phenylalanine. According to early research, phenylalanine is good for the treatment of certain forms of depression. Its supplements have been used for a number of medical conditions and issues. Depression: for depression you have to take in approximately 3 to 4 g L- phenylalanine or 150 – 200 mg of dl-phenylalanine. Results: improved mood/attitude in people suffering from depression. Pain: approximately 1,500 mg daily. Results: The enzyme that cause pain in the body are blocked. It is effective in treating some chronic pain. If your body lacks the necessary phenylalanine hydroxilase enzyme activity to convert phenylalanine to tyrosine, your body will not e able to metabolise phenylalanine. This leads to a condition called phenylketonuria or PKU. Here the excessive amounts of phenylalanine get converted into phenylketonurians instead of tyrosine. Phenylketonurians appear in urine. If you do not treat this problem, it can lead to mental retardation. In infants who are only a few weeks old, phenylketonurians can cause brain damage if not treated on time. Today, in some countries like the US, newborns are tested for PKU within 48 to 72 hours after their birth. A person with PKU should avoid foods and beverages that contain phenylalanine and they also have to take in tyrosine supplements. This is necessary for the proper development of the brain. There is a lack of scientific studies as to how well phenylalanine can be utilized for medical purposes, such as for Parkinson’s disease symptoms, depression and chronic pain. However, few explorations into such use have been conducted. D- Phenylalanine has undergone some research so as to see how it is useful for the treatment of chronic pain. Very few studies have been made to show how efficient it is and the positive results it can give. The studies made lack in detail, results and possibly oversight. More studies are needed to see how efficient it is and whether it is safe for us to use. However, whatever studies have made shows that use of dD phenylalanine for chronic pain provide no beneficial effects over the administration of placebo. A number of studies have been conducted since 1970 to see whether phenylalanine can be sued as a reliable treatment for depression. Here also the lack of studies has failed to give a complete picture. It is still uncertain whether it has a good effect on the mood. But some individuals have reported that there is an improvement in mood when they took phenylalanine. Still, additional research is needed to verify the efficacy. Phenylalanine and pyroxene have been used for treating schizophrenia. But its benefits as a treatment for depression, anxiety or bipolar disorders are yet to be proved completely. Early studies have shown that its use led to a definite improvement of mood in a group of people suffering from depression. A group of people who had not responded to traditional MAOIs were made to use d- phenylalanine.. They were given 50 to 100 mg phenylalanine daily for 15 days. The result showed that 13 of the patients showed some improvement after 13 days. In 1977 20 patients suffering from depression were given 75 mg to 200 mg phenylalanine for 20 days. Four out of them showed significant improvement, while eight were cured. Four showed mild response while the last four showed no improvement after being treated. In 1984, phenylalanine was combined with selegiline and used as an antidepressant. 155 peope with depression were given this. Almost 90% of the patients showed effective results and 81% showed positive results. Studies made on animals show that phenylalanine can improve balance, walking, reduced rigidity, depression as well as speech difficulties associated with Parkinson’s disease. Till date no studies on humans have been done. Pregnant women, people suffering from diabetes, anxiety attacks, high blood pressure, pre-existing pigmented melanoma or phenylketonuria are advised not to have supplemental form of phenylalanine or products containing artificial sweeteners like aspartame. L- phenylalanine may interact with drugs taken in for the treatment of tardive dyskinesia, which is a side effect that people suffer from when they are taking neuroleptics. This is a drug for Parkinson’s disease. Phenylalanine may reduce the efficiency of these drugs. the absorption of baclofen may be interrupted when you use phenylalanine. This drug is used for reducing and to get relief from muscle spasms that often come with Parkinson’s disease. When selegiline is combined with L-phenylalanine, it can enhance the antidepressant effects of phenylalanine. So, you should never take them together.